Carol Secttor was a teacher at McCulloch Middle School in the 1970s. During her lesson on the civil rights movement, she played a seemingly harmless video that talked a bit about the KKK. When the video was finished, her students began to ask questions about the Klan. Soon after, she received a threatening letter from the KKK in the mail. DE: Okay, So I need you to state your name please? DE: And then your address? CS: 4559 South Bellamy Boulevard. DE: Okay, and then how many years did you teach at McCulloch, and when did you start and end? CS: I taught at McCulloch from 1968 to 1972, and then I taught at Justice beginning in the fall of ’72. DE: Okay, what subject did you teach at the time? CS: I taught Social Studies, 7th grade I think. DE: Okay, and then can you describe the lesson you taught, or you tried to teach when the Ku Klux Klan sent you the letter? CS: Well, it was a, we were doing a unit on Civil Rights, so the lesson wasn’t specific to the Klan, it was about the Civil Rights Movement at the time, and I showed a film and in that film there was a scene of a KKK rally. So, that’s what, and kids ask questions about them, I answered them, and that’s what prompted the letter. DE: Okay, and then what year was this? CS: I think it was in the fall of 1970, to the best my memory. DE: Okay and then like how did they find out that you were teaching the lesson? CS: I don’t know for sure, except I assume that one of the students I had in class went home and talked to his or her parents, that’s the best guess I have. DE: Were you cautious in what you taught after the threat? CS: No,I don’t think it changed anything about my teaching, I was pretty young and Naïve at the time, and it took me a while, can I interrupt a minute? DE: Okay, so were you cautious in what you taught after the threat? CS: I really don’t think it changed anything I did in my teaching, I was really pretty young and naïve at the time and it took me a while to realize it was a real threat, I really didn’t connect to that right away. DE: And then, what was the student base like at McCulloch? CS: Yeah, it was just very diverse, I don’t know percentages, but it a was very diverse population at that time. DE: Okay, and then the teaching staff, what were they like? CS: The teaching staff at that time was, overall very young, because that was the time in Marion when the population was really growing, unlike today, they were hiring a lot of teachers, in fact, the year I started teaching they hired a hundred teachers if you could imagine, I mean, compared to maybe 10 or 12 right now. So, and they had done that over a 2 or 3 year period, so there were a lot of young teachers. The teaching staff was not as diverse as the student population, which is pretty typical. DE: Okay, did you contact the police after the threats or did they take any action? CS: No, I didn’t, I mean, I went to my principal, who was much more concerned than I was originally, and I don’t know what he might have done at that time. I don’t know that the police were contacted, but I don’t know that they weren’t either. He just advised me in terms of my classroom, and at the time, that was all I was really interested in. DE: What did the letter say, could you read it maybe? CS: It’s addressed to me, and it says “If I am not mistaken it is your duty to present your students with the truth and nothing but the truth. Enclosed are a few pieces of literature that might enlighten you and your students on the beliefs and goals of the KKK. It will be interesting to see whether or not you show this enclosed literature to your students” and it’s signed “For God, country and race, the Grant County Clan #10”. DE: Okay, is there anything else important? Oh, sorry, have you ever heard of the Marion lynching’s that took place? DE: Okay, did you ever teach about the lynching and why or why not? CS: I don’t know that I ever really taught about the lynching, those times were pretty charged racially in Marion, in the city of Marion. And I don’t know that, I mean, I’m sure it came up in discussion because, it would with kids, I taught junior high, but in terms of really teaching about it, I don’t recall ever doing that. And it was probably a little later before that became a real point of study for students in social studies classes here. CS: You mean the lynching itself? CS: Oh, I don’t know, I mean, I grew up not too far from here, out in the country, in Wells county, and I probably heard about it pretty early on when I moved to Marion just as a point of History, not all points of history are positive points for communities, and that certainly wasn’t one, so. DE: Is there anything else important you’d like to note? CS: I just would mention that it might be relevant that with the letter there was probably 10, 12 pieces of literature from the time, so it might be of interest to somebody who’s studying. DE: Ok, and then would you mind if we maybe scanned them in the school scanners or something? CS: I would be happy to just donate them to the project. CS: I would be happy, if you want them, that you just take them, and I don’t have any need for them in there. Unfortunately, or fortunately as people would look at it, a part of our history which could be available to somebody doing that kind of research. DE: Okay, well thank you for the interview. DE: And this is it, so. Klan propaganda with handwriting from the Klan member who sent the envelope. 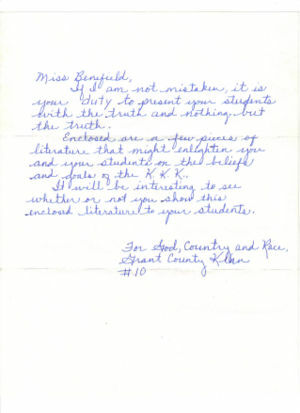 A brochure on the Black Panthers includign handwriting from the Klan member who sent the envelope. A Klan propaganda letter that includes a signup form to join the Klan. "The Fiery Cross Bulletin" A Klan newsletter with an included Klan signup sheet. "Knights of the KKK" Brochure with information on the Klan. Klan propaganda brochure about how integrating the schools is bad. Klan propaganda brochure on what the uniform stands for. "Savagery in the Raw" Racially charged document about white supremacy. The contents of this arictle were scanned, written, and transcribed by Dallas Elliott for Mr. Munn's IU ACP History Class at Marion High School during May 2011. This page was last modified on 26 May 2011, at 05:31.